In 1998, a British doctor named Andrew Wakefield published a paper in the British journal The Lancet. In this paper, Wakefield implied that the measles, mumps, and rubella (MMR) vaccine may cause developmental disorders such as autism spectrum disorder (ASD). The paper received wide publicity, and subsequently, MMR vaccination rates began to decline, triggering the current anti-vaccine movement and the re-emergence of previously controlled diseases. Since this unfortunate event, many scientific studies, articles, editorials, and books have been published that totally discredit a causative link between vaccination and ASD. 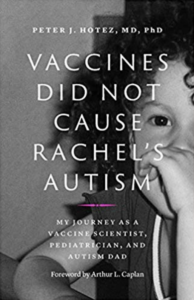 Pediatrician and vaccine scientist Peter Hotez also published a book on this topic, titled Vaccines did not Cause Rachel’s Autism. Hotez’s book has a slightly different angle because “Rachel” happens to be his daughter. In the book, Hotez goes into excruciating detail about the challenges and personal drama involved with raising an autistic child and living with an adult daughter with ASD. The book is unique because it blends a personal story from the perspective of an autism dad, with solid, systematic, and comprehensive science. There is no link between any side effects from vaccination (such as temporary fever) and ASD. The preservative thimerosal (ethylmercury) in multi-dose vials of pediatric vaccines does not cause ASD. Additionally, the rates of autism have continued to increase, even though thimerosal was removed from all childhood vaccines in 2001 (solely as a precautionary measure). Aluminum (an ingredient that enhances the immune response) in vaccines does not cause ASD. Administering vaccines closely together does not cause ASD. The idea of “antigenic overload” (i.e., too many vaccines in a short time frame) disregards the fact that an infant’s immune system is bombarded with dozens or hundreds of new antigens every day. Vaccines do not cause autoimmune disorders. In short, every single study aiming to verify a causal link between vaccination and ASD to this date has found no such link. It is important to note that the American Academy of Pediatrics is not connected to the US government, thus invalidating any claims that this document is motivated by an alleged government conspiracy. Hotez stresses that these epidemiological studies were carried out under carefully controlled conditions and collectively involved more than one million children. In contrast, Wakefield’s study lacked a proper control group and involved twelve children who had been specifically selected because their medical background fit a preconceived idea. In addition, Wakefield manipulated the data, failed to declare multiple financial conflicts of interest, and committed other forms of serious professional misconduct. By 2004, ten of his twelve co-authors retracted their authorship, stating that their initial interpretation of the data was incorrect and that there is no causal link between vaccination and ASD. By 2010, The Lancet retracted the paper and the editor apologetically admitted that the study’s conclusions were highly inaccurate. Having dealt with the hurdles of drug development his entire career, Hotez describes how difficult it is to obtain FDA approval for any given vaccine formulation. The process takes at least a decade and during this time, the necessity of each ingredient has to be justified and its safety proven. Even once a vaccine is approved for public use, its safety is continually monitored through post-market safety surveillance and the Vaccine Adverse Event Reporting System. The policies in place to ensure the safety of vaccines are exhaustive and redundant. That being said, vaccine adverse events can happen. However, considering the large number of vaccines administered in the United States every year, these instances are so rare that according to the National Vaccine Injury Compensation Program, the likelihood of a person sustaining a severe injury from a vaccine is about 1 in 1,000,000. For perspective, the likelihood of being struck by lightning in any one year, is much greater (1 in 700,000). Hotez also offers plenty of evidence for what does cause ASD. While scientists have not identified one specific cause, evidence suggests a strong genetic basis, with mutations in up to 1000 genes linked to a characteristic overgrowth of the prefrontal cortex and temporal lobe of the brain. This overgrowth is initiated at least a year before onset of symptoms, and hence, well before vaccination. We also know that environmental factors and/or changes in gene regulation (epigenetics) play a strong causative role and that the processes leading to an ultimate ASD diagnosis begin in the womb. Interestingly, the most convincing environmental cause of ASD is congenital rubella syndrome, thereby ironically suggesting that MMR vaccination actually prevents ASD. Anti-vaccine advocates often assert that our body’s natural immunity is adequate to overcome common childhood infections and that natural infection with a disease like measles strengthens the immune system. In fact, the opposite is true. Almost a million unvaccinated children die from vaccine-preventable diseases each year. In the years following the eradication of smallpox, measles in particular was the single leading killer of children, with two million children dying of measles every year. Even when it doesn’t kill, measles encephalitis and pneumonia can cause permanent injury and absolutely devastate the immune system. Science is a self-correcting process and any seminal discovery or causative claim of high public interest will be scrutinized by the scientific community ad nauseam. The claim for a causal relationship between vaccination and ASD is possibly the most thoroughly scrutinized claim in all of biomedical science. And the conclusions are clear and unambiguous. Unfortunately, Wakefield’s claims gained quick momentum, giving rise to an ideology that is continually amplified and perpetuated by his followers. Today, the anti-vaccine movement is a well-funded and well-organized lobby with more than 400 websites that are backed by political action committees, social media, and poorly informed celebrities with loud voices. The resultant return of vaccine-preventable diseases and their effect on public health is alarming, to say the least. Peter Hotez actively advocates for vaccination by regularly and publicly denouncing anti-vaccine claims and by promoting the safety and necessity of vaccination through a variety of media outlets. However, there is an imminent need for additional prominent scientists, public health leaders and politicians to join him in this endeavor. Typo at the end? Seems odd to finish with there being an ‘imminent need’. Did they mean ’eminent’ or ‘evident’? Either way, ‘pressing’ or ‘urgent’, would be more appropriate for a disaster already in the making. There’s no typo, “they” meant imminent. As in, there’s an immediate need. Scientists need to go out and do what Peter Hotez is doing. Right now. Nevertheless, thank you for your comment.